W. St J. Glenn and Post War Teddy Tail and Teddy Tail Annuals. W St J. Glenn, who had had his own strip cartoon “Dorothea” in the Daily Mail prior to the war, (1) had returned in the autumn of 1945 and, as Features Editor, initiated the Strip Cartoon Department. (2 ) When the Teddy Tail strip resumed in the paper in 1946, it was drawn by Arthur Potts, known as “ Spot.” In 1954 W. St J. Glenn took over drawing Teddy Tail daily until it ended. 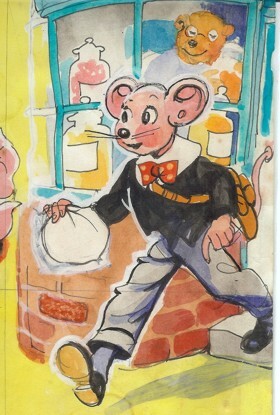 (3) The Teddy Tail Annual involved more artists, colour illustrations, puzzles and games. 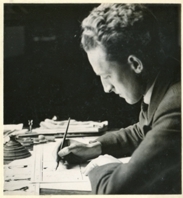 Glenn as art editor for the Daily Mail, and cartoonist and illustrator in his own right,(4 ) was involved in the production of the Teddy Tail Annual. He designed all the colourful covers from 1948 until the end with the exception of 1952 when serious illness prevented this and the covers were designed instead by Roland Davies. No dates are written on the Daily Mail’s Teddy Tail Annuals after the war but we can establish that they were published again from Christmas 1948. The annuals were on sale at Christmas and given as Christmas and New Year presents. The British Library had copies date stamped to show when they were received at the library. Teddy Tail is on stage; the background is orange, other characters are playing instruments. There were 125 pages and an index at the back. Christmas 1949. Again printed by Juvenile Productions Ltd, as were all the Teddy Tail Annuals until 1953. Date stamps indicate that this Annual was not received at the British Library until 9th November 1950, when it appeared along with the one for 1950. On the front cover Teddy Tail is on top of a fountain, the background is blue. There were 125 pages and an index at the back. The cover was signed by W. St. John Glenn. Christmas 1950. On the front cover Teddy Tail is on a merry-go-round with a red and white top. There are 125 pages and an index at the back. W. St J Glenn signed the outside covers. Christmas 1951 On the front cover Teddy Tail is on a yellow cloud of steam coming from a steamroller. The British Library received a copy in December 1951. The annual has 93 pages and no index. W. St J. Glenn signed the outside covers. Christmas 1952 On the front cover Teddy Tail is in a car with number plates T.T.1952. This seems a clear indication that the Annual was produced for 1952. Roland Davies signed the outside cover for the annual this year. There are 93 pages and no index. Christmas 1953 On the front cover Teddy Tail is dressed as a cowboy riding on a kangaroo. The background is orange. There are 93 pages. W. St J. Glenn signed the outside cover. Christmas 1954 Described as the Daily Mail "New” Teddy Tail Annual this was printed by Morrison and Gibb Ltd for the Publishers (Associated Newspapers). On the front cover Teddy Tail is calling “Hello there!” The British Library received a copy in 31/8/54. W. St J. Glenn signed the outside cover. Christmas 1955 On the front cover Teddy Tail is seated playing a trombone. The background is yellow. It’s the smaller size of 1954,with the same colourful writing on the cover and priced at 5/- (Five shillings.) The British Library received a copy in 29/8/55. W. St. J. Glenn signed the outside cover. 1)“Dorothea”. A large illustrated announcement of the new cartoon strip “Dorothea” by Glenn appeared on page 8 of The Daily Mail on Monday, August 31, 1936. The strip ran until the outbreak of World War Two in 1939. 2) See The Daily Mail Annual for Boys and Girls/ Christmas 1946, edited by Susan French. (To identify it, there is a calendar for 1947 on page 13) Susan French has written an article in the book about the Daily Mail’s cartoonists, “They scribbled on their copybooks”. The article is detailed and gives a photo of each artist and a history of their work. There is a separate entry for A. Potts and W. St J. Glenn. 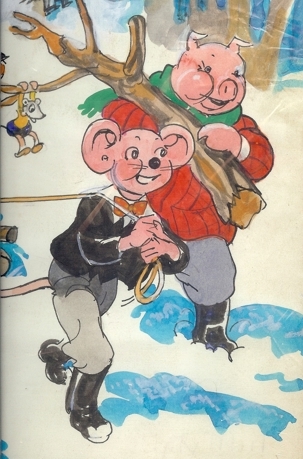 5)Copies of all the Teddy Tail Annuals mentioned (with the exception of 1953) can be found in the British Library with date stamps indicating the month and year the library received them. The Teddy Tail Annuals continued further and the history follows below.